You can rent a set of our older commercial laser tag toys from us so that you can run you own self-paced laser tag event at your leisure. This program was started to assist family celebrations when we are already committed for our chaperoned parties. Some clients prefer the flexibility this rental program allows for their event. Many families or youth groups will host two events, one for the birthday child and one for a sibling or one event for grade school youth and one for MS/HS youth. Almost everyone has a bonus event with the neighborhood kids after their main event. We have multiple sets of rental laser tag guns available for this program. Rick delivers a packaged set of laser tag toys to your location by appointment. Deliveries are scheduled on Thursday morning or Friday morning. Rick will give you a short operational tutorial at the time of delivery so that you can effectively manage your event. Please schedule approximately 45 minutes for this administrative time. Rick will schedule the equipment pickup at the time of delivery, generally on Monday. The rental package will include the predetermined number of toys, operating instructions, a list of suggested games, two whistles with keys and a couple rolls of different colored surveyor’s ribbon. The toy laser tag toys will be delivered fully charged. You should expect the battery life to be sufficient for approximately four hours of game-play. We do not have the ability to recharge the toys during your rental period. We can not provide transformers to allow clients to recharge the toy guns. Please refrain from extra use prior to your main party because of the limited battery life. Remember to turn off the toys when they are in storage. 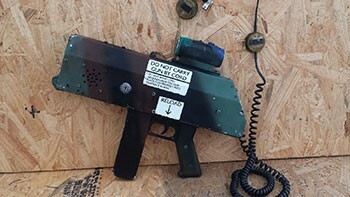 The Berzerker sub-machine gun is our original laser tag toy. The Berzerker has a wooden case that some parents prefer due to the toyish appearance. The Berzerker weighs in at five pounds and has an effective range of approximately 200 feet which makes it ideal for indoor or outdoor game-play. 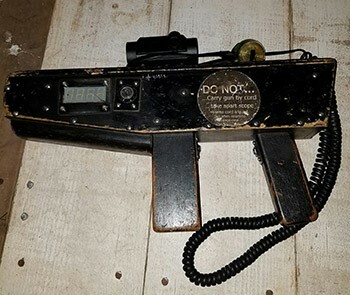 The Scorpion sub-machine gun was our workhorse laser tag toy until we upgraded to our present party guns. The Scorpion has a metal case and red dot scope to provide the “WOW factor” preferred by our many veteran players. The Scorpion weighs in at five pounds and has an effective range of almost 300 feet.